Not for the starving artist. Louis Vuitton is set to release a luxurious take on coloring pencils. Presented as a roll-up case, the leather coloring pencil set sees LV’s signature monogram motif on the exterior, while on the reverse side, 40 wooden color pencils are individually slotted into place for carrying. To secure the the pencils when on the move, a soft calfskin strip of leather can be fastened to a metal hardware ring to ensure that the roll does not come unraveled while in your backpack or tote bag. A nice detail can be seen on the monogram side, where each of the pencil’s respective colors are hand-painted in a circle to identify the position of each color. 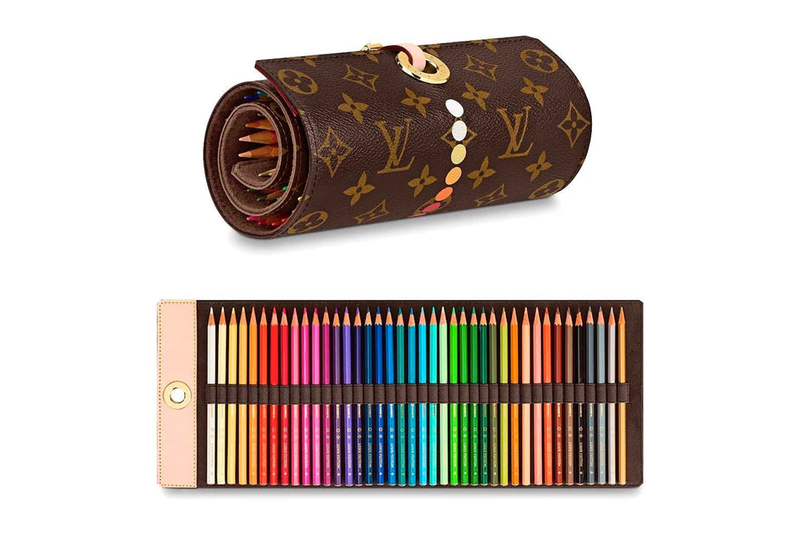 Priced at approximately $900 USD, the Louis Vuitton Coloring Pencil Set is slated to go on sale in April, and would make for a great home accessory. In other news, Virgil Abloh & Evian continue collaboration with a 75cl bottle. According to new “Becoming Pikachu” featurette. Boasting a Fuchsia-light blue gradient. Alongside Lil Pump and Kehlani’s new projects.